Oasis to play Wembley Stadium? 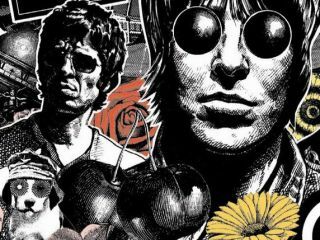 Oasis look set to play Wembley Stadium on their biggest tour ever in support of Dig Out Your Soul, the band's seventh studio album set for a 6 October release. Exact dates will be confirmed in the coming weeks, but the world tour, which will begin in the UK in October, could run to 18 months and rival the scale of recent stadium jaunts by The Rolling Stones and U2. The City of Manchester Stadium - home of the Gallaghers' beloved Manchester City Football Club - is also strongly tipped to host at least one of the dates. A source told a UK tabloid: "The tour is bigger than anything the band have done before. They will be on the road for more than a year - possibly pushing 18 months. "The dates could easily run into three figures and will take them around the world. It is on the kind of scale you would expect from The Rolling Stones. The fellas who have hatched the plan are very proud and excited." Click here for a taster of The Shock Of The Lightning, the first single from Dig Out Your Soul, released on 29 September.